As 37000 people gathered on Rajpath on Sunday morning to celebrate World Yoga Day with the Prime Minister, the Indian Army commemorated the day in their own unique way. 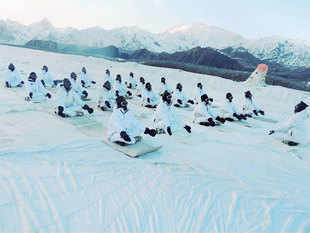 A few members of the armed forces performed Yoga on the Siachen glacier at a height of 18,800 feet above sea level. At 7 AM in the morning, the army men practised Yoga in the snow, wearing their special weather clothing at a temperature of -4 degree Celsius. According to a national daily, the Navy also held yoga sessions across its installations and on Indian Navy ships deployed overseas in South China Sea. Chief of Army Staff General Dalbir Singh and the army on Sunday wished the nation on the International Yoga Day. Greetings were shared from the official twitter account of the Additional Directorate General of Public Information, Integrated Headquarters of the Ministry of Defence (Army).